CINCH FootStays with 'FootStay Pads'...The FootStay Pads are not necessary, but they will make your ankles 'Laugh' around the lake for those long rides. Built with Nylon covered neoprene and hook for easy attachment and removal. Masterline 12" Handle Attachment, approximately 5' in length. This handle floats. New from CINCH. Head and Ear protection at the right price point. Very comfortable and good looking. Adjustable $55.00. 2018 CINCH Foil Stand.....This is an excellent way to store your Foil. Sturdy and long lasting. CINCH Helmet, Light and comfortable. 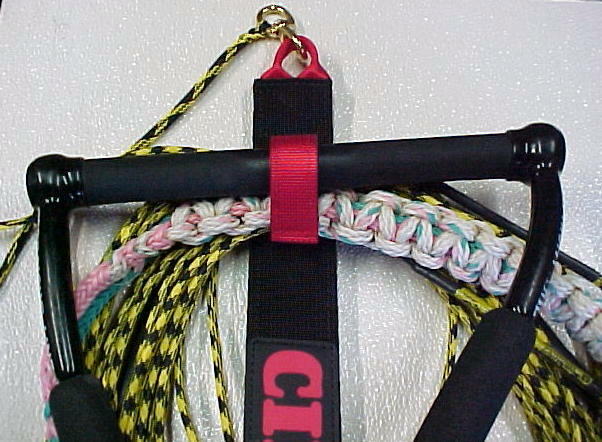 The original 2:1 lap belt with more Hook and Loop. Automatic release that operates on tow line tension. Now with built-in RopeStay! 3" wide Neoprene replacement pad for the 'Max'. Red or Black. 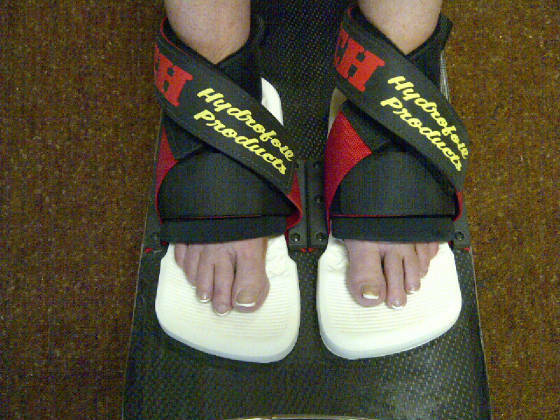 Foot restraints to keep your feet in the bindings. A must for performing inverts. 'FootWraps' replace the original binding and overlay and are adjustable. adjusts from approximately 26" to 36". remove the Zip Extender with no tools. 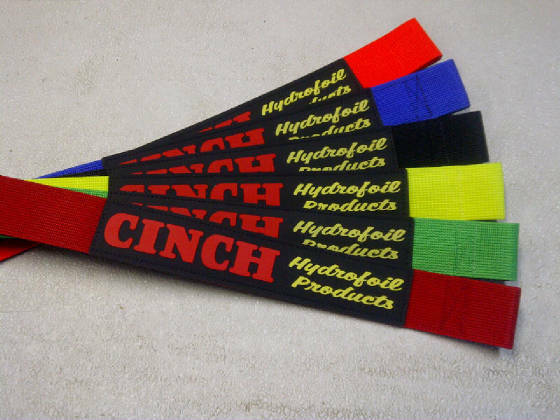 Keeps your Tow Line neat and out of the way when not in use. 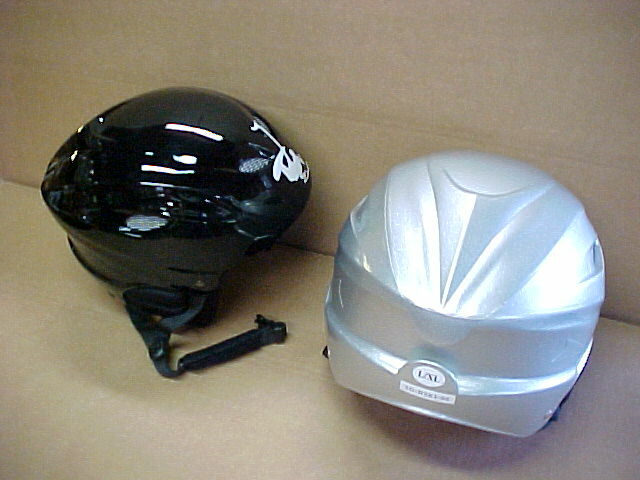 **CINCH STOCKS A VERY GOOD SELECTION OF SKY SKI PARTS. NEED A PART? WE PROBABLY HAVE IT! GIVE US A CALL! 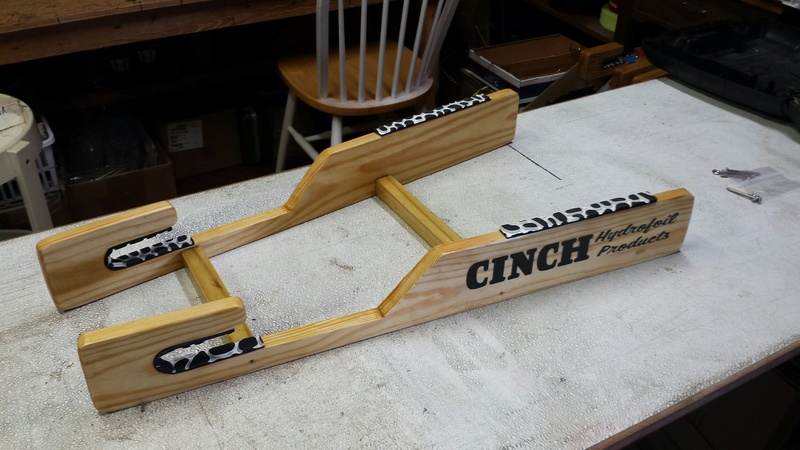 To order a CINCH Max®, sit or kneel on your hydrofoil/kneeboard and take a measurement across your lap from footman loop to footman loop. 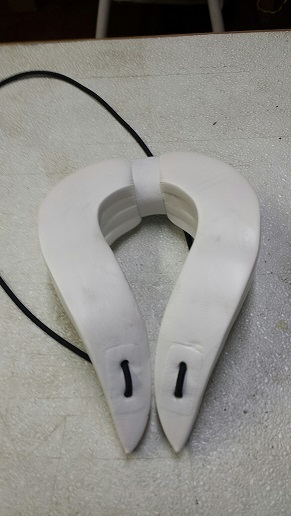 Footman loops are the equipment rings that attach the CINCH to seat base/kneeboard. If your Sky Ski has Swivels installed, measure from Swivel to Swivel. This measurement should be taken tight. If it falls between 30" and 34", a standard 'Max' will work just fine. For special sizes, just call with the measurement, and we will custom fit a 'Max' to you at no additional cost. Most orders can be shipped the same day! Note...Hydrofoil seat tower should have footman loops, swivels or CINCH Angled Footman Brackets to properly use a CINCH 'Max'®. All CINCH products are shipped PRIORITY MAIL in the USA and outside the USA unless specified otherwise. Sky Skis are shipped FedEx. CINCH products have a 6 month warranty covering defects in workmanship from the date of purchase. Any defects in workmanship will be repaired or replaced at our discretion in that time period. Normal wear and tear on webbing or hook and loop is not covered in this warranty. Customer agrees to pay for shipping to CINCH and be invoiced for return shipment on all items sent in for repair, replacement or exchange. This product is designed for use by experienced hydrofoil riders only! With any sport there is always a risk of injury and, in some cases, death. Under no condition is the seller or the manufacturer to be held liable for any injury or damage, direct or consequential, arising out of the use or the inability to use this product. User assumes all risks and liability connected with the use of CINCH products. CINCH reserves the right to adjust prices without notice due to market changes and price fluctuations in raw materials. Colors for 2018! You asked for them and here they are! Hot Yellow and Hot Green is available on the CINCH Max lap belt, FootStays, FootWraps and CINCH Releases! 2018 CINCH Release with Rope Stay.